While we were pursuing Pinterest for Easter-inspired treats, we came across this owl cake. We figured: substitute the owls for peeps and BAM- how festive! We decided to try it out for your reading pleasure and to make sure it would look alright. We love that this shenanigan is a “cake” made out of cupcakes. This makes it perfect to bring to a meeting or a class- everyone gets a cupcake and there’s no cutting slices and no mess. Spread the chocolate icing on the trunk section of your tree. Mix your white icing and a few drops of green food coloring together in a bowl until you’ve reached your ideal leaf color. 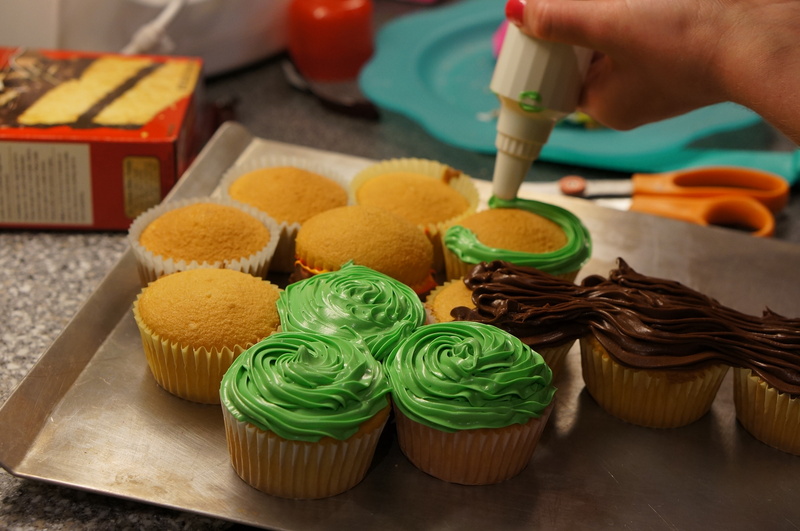 Using an icing tube or our favorite Ziploc trick, put the green icing on the cupcakes that will make up the leafy part of the tree. We added some chocolate icing “branches” to our tree to finish it off. Finally, place your peeps on the leafy part of your tree. 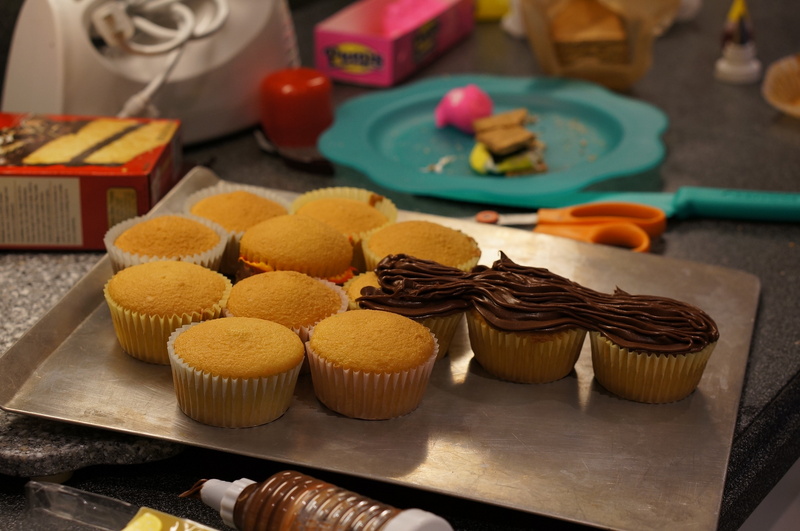 We used ours to cover up any holes in the cupcake design. You’re all done! We really liked this shenanigan because the peeps made it festive; but throw on some flowers and you’ve got a great springtime treat. Or you could use orange, red and yellow icing instead of green if it’s fall! What a great Easter surprise for the kids!!! They will love it!! So bright & fun!! 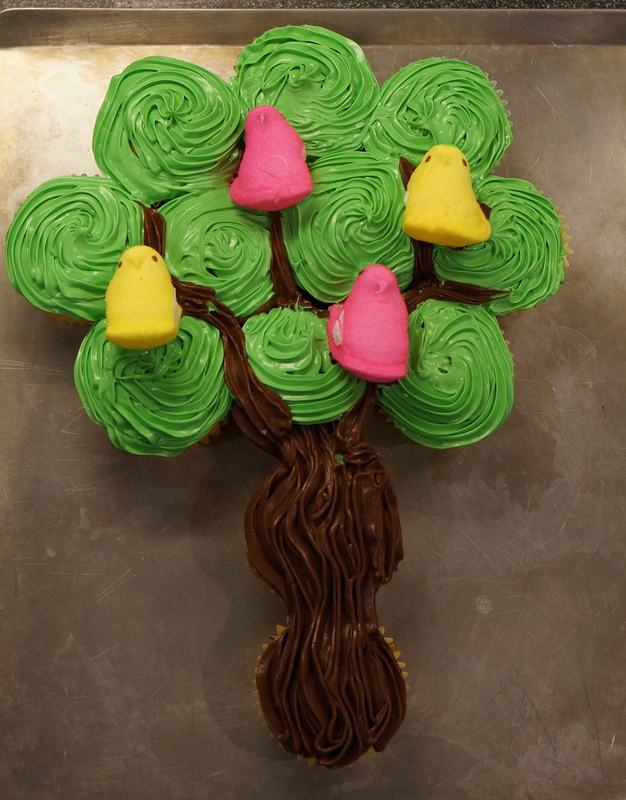 Both of these cupcake trees are adorable! 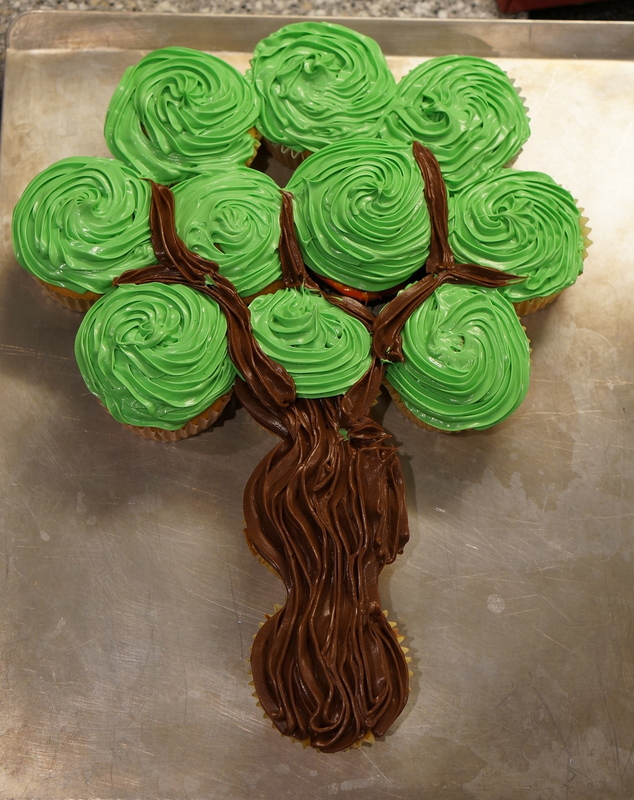 I like your version better though, less cupcakes in the tree mean less temptation! Haha, thanks! If you want even less of a temptation, you can use mini cupcakes! Love this! And like you said — the best part is that it is in fact cupcakes, so perfect for taking to an event, office, party, etc. Absolutely adorable… They are well crafted and look yummy! Thanks! Hope you have a Happy Easter!